See how relaxed these people look? They’re clapping and listening to the band that performed at Albany’s Monteith Riverpark on Monday evening. These Monday events are less well known than the Thursday night River Rhythms concerts at the same place. But they nevertheless have considerable appeal. On KGAL radio’s “Valley Talk” program Tuesday morning, host Jeff McMahon and I were talking about the many free summertime events people around here get the chance to attend. I singled out the Monday night concerts because they are, well, more laid back than the Thursday shows. As you can see, on Monday nights there’s plenty of room for people to sit on the grass. You don’t have to stake out your space in advance. There’s less of an effort at crowd control with fences and gates and so forth. And the musical talent is often local or at least regional, though the group that played on Monday was from California’s Bay Area. Three more concerts are on the Monday schedule for this summer, according to the web site of Albany Parks and Recreation, which organizes both the Monday and Thursday series. Next Monday, Juy 21, you can listen to the Albany Swing Band. 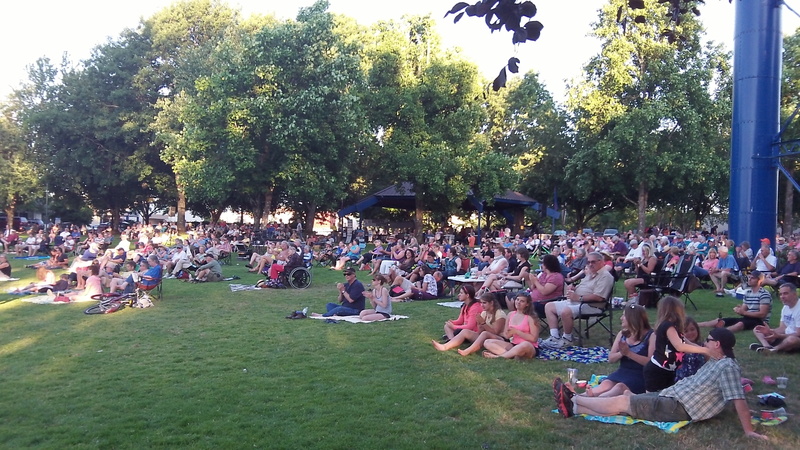 The last two Monday concerts will feature a Willamette Valley group calling itself Concrete Loveseat (whose music, one hopes, will be less uncomfortable than its name) on July 28, and then the Salem-based Willamette Master Choir on Aug. 4.